The women interested in the Rh factor in blood types should know that there are four main blood types: A, AB, B and O. These are determined by the antigens of the body. These are proteins of the blood that make the immune system have some kind of reaction. The Rh factor is a protein of this kind. It is normal for the pregnant women to have a blood test to determine their Rh factor. If the blood doesn’t have this antigen, it means that you are Rh-negative. 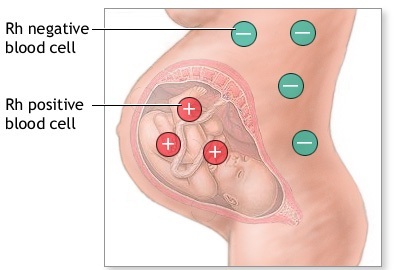 If the father is Rh-positive, it is possible for the baby to be Rh-positive too. The problems arise when the Rh factor of the mother and the baby are different. If the Rh factor of your blood is positive and the baby’s is negative, your body may develop antibodies. If the two blood types get mixed, which usually occurs, your body will start producing antibodies. This is something like you were allergic to your own baby. When thinking about Rh factor in blood types, you should also consider sensitization. This means that the body starts producing antibodies which are able to cross the placenta. These will break down the blood cells of the baby and as a result he or she could become anemic. If you become sensitized, the baby can become severely ill, he or she may suffer brain damage and the problems can even lead to death. Sensitization usually occurs if the mother has a miscarriage, an ectopic pregnancy, induced abortion, blood transfusion or chorionic villus sampling. What can you do about the Rh factor in blood types? As it has been mentioned before, in order to find out what blood type you have, you should have a blood test. An antibody screen can also provide you with the information that you need. If you turn out to be Rh-negative, you will need Rh immunoglobulin which will prevent you from being sensitized. In case you are interested in the Rh factor in blood types it is good to know that RhIg is usually given to women around the 28th week of pregnancy. After the baby is born the mother could get another shot to make sure that she won’t be sensitized by the baby’s remaining blood cells.